​A Still Small Voice 4U Inc. (ASSV) is a 501(c)3 not for profit devoted to encouraging and supporting arts, music, literature, culture and community. ASSV directly supports individuals and organizations that share its mission and commitment. ASSV sponsors concerts, exhibits, performances, readings and community activities. ASSV does not solicit donations or conduct fund raising for itself. Those wanting to support our efforts are encouraged to buy tickets to the events we sponsor. Charlie King, the musical storyteller and political satirist, won the 2017 Phil Ochs Award given to singer songwriters whose music and activism embody the spirit and commitment of legendary folk singer Phil Ochs. Charlie has been at the heart of American folk music for half a century. He sings and writes passionately about the extraordinary lives of ordinary people. His songs have been sung by Pete Seeger, Holly Near, Ronnie Gilbert, John McCutcheon, Arlo Guthrie, Peggy Seeger, Chad Mitchell and Judy Small, to name a few. Pete Seeger called Charlie “One of the finest singers and songwriters of our time.” Among Charlie's best known songs are "Buy, Buy This American Car", That's the Way I Made My Millions", "Two Good Arms" and "Send in the Drones". Charlie was presented with a plaque commemorating the award and a cash stipend of $2000 at a concert presented by the Schenectady County Historical Society at Mabee Farms Dutch Barn in Rotterdam Junction, NY on Sunday October 8, 2017. 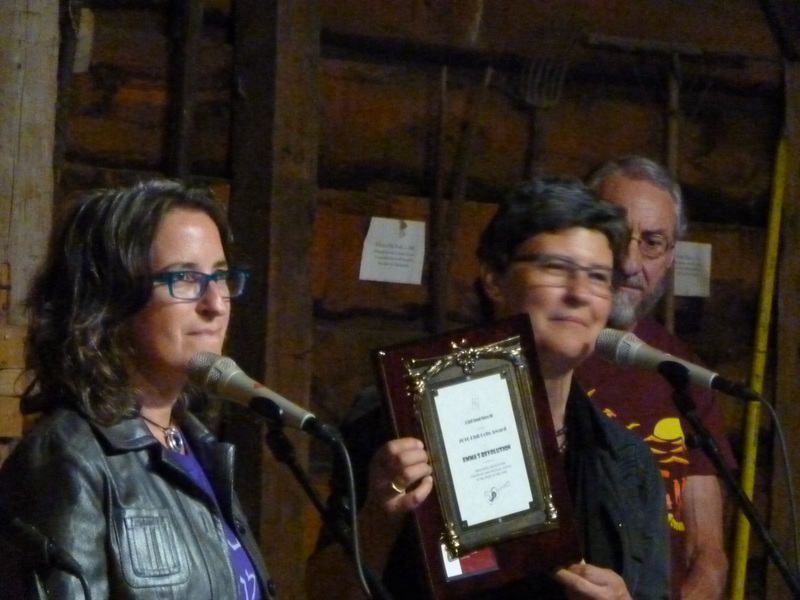 The award was presented by Phil Ochs' sister Sonny Ochs and by Ron and Kathy Cooke and Chad Phillips representing A Still Small Voice 4U that sponsors the award. Additional funding was generously contributed by Michael Sussman, a civil rights and environmental lawyer, from Orange County, NY. The Phil Ochs Award is presented annually by A Still Small Voice 4U Inc. (ASSV) a 501(c)3 not for profit devoted to encouraging and supporting arts, music, literature, culture and community. The award is determined by a national panel of judges. ASSV directly supports individuals and organizations that share its mission and commitment and sponsors concerts, exhibits, performances, readings and community activities. More information is available at http://www.assv4u.com/. ​Winner receives a cash award. A national panel of judges will review the nominations and make recommendations to the board of ASSV4U. Presented by: A Still Small Voice 4U Inc. Through partnership with local organizations ASSV uses concerts to both support performers and to benefit local groups connected to the arts, social causes or other charities. ASSV covers the cost of the artist. The partner organization provides a venue if possible and handles ticketing. ASSV, the partner organization and the performer all collaborate on advertising. All ticket proceeds go to the partner organization. In this way the performer gets exposure at a paid presentation and the benefiting organization has a fund raiser..
​ASSV presents the Annual Phil Ochs' Award given to an individual or group whose activities carry on the spirit of Phil Ochs' music and activism. For information or to suggest possible recipients please email us at assv4u@hotmail.com. Pat and Sandy were presented with a plaque commemorating the award and a cash stipend of $1000 at a concert presented by the Schenectady County Historical Society at Mabee Farms Dutch Barn in Rotterdam Junction, NY on Friday September 16, 2016. The award was presented by Phil Ochs' sister Sonny Ochs and Ron and Kathy Cooke and Chad Phillips representing A Still Small Voice 4U that sponsors the award. The Phil Ochs Award is presented annually by A Still Small Voice 4U Inc. (ASSV) a 501(c)3 not for profit devoted to encouraging and supporting arts, music, literature, culture and community. The award is determined by a national panel of judges. ASSV directly supports individuals and organizations that share its mission and commitment. ASSV sponsors concerts, exhibits, performances, readings and community activities. More information is available at http://www.assv4u.com/.